On the morning of the 16th of July, I was stationed at the Base Camp at Trinity in a position about ten miles from the site of the explosion. The explosion took place at about 5:30 A.M. I had my face protected by a large board in which a piece of dark welding glass had been inserted. My first impression of the explosion was the very intense flash of light, and a sensation of heat on the parts of my body that were exposed. Although I did not look directly towards the object, I had the impression that suddenly the countryside became brighter than in full daylight. I subsequently looked in the direction of the explosion through the dark glass and could see something that looked like a conglomeration of flames that promptly started rising. After a few seconds the rising flames lost their brightness and appeared as a huge pillar of smoke with an expanded head like a gigantic mushroom that rose rapidly beyond the clouds probably to a height of the order of 30,000 feet. After reaching its full height, the smoke stayed stationary for a while before the wind started dispersing it. About 40 seconds after the explosion the air blast reached me. I tried to estimate its strength by dropping from about six feet small pieces of paper before, during and after the passage of the blast wave. Since at the time, there was no wind I could observe very distinctly and actually measure the displacement of the pieces of paper that were in the process of falling while the blast was passing. 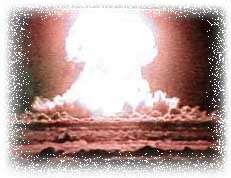 The shift was about 2 1/2 meters, which, at the time, I estimated to correspond to the blast that would be produced by ten thousand tons of T.N.T.
.:: Radiochemistry.org© 2003 - all rights reserved ::.